Hawaii's seasonally adjusted jobless rate increased to 3.3 percent in April, the first month to reflect the high-profile closures of Molokai Ranch, Aloha Airlines and ATA Airlines, according to data released yesterday by the state Department of Labor and Industrial Relations. The state's unemployment rate last month increased only slightly from 3.1 percent in March, but was up from 2.5 percent in the year-earlier period. Effects of recent mass layoffs and announced closures of several companies were only partially reflected in the April payroll data. About 2,100 Aloha and ATA employees lost their jobs in the shutdown, and an additional 3,820 people who work for companies who did business with Aloha and ATA also could eventually lose their jobs, the state Department of Business Economic Development and Tourism said in a preliminary impact forecast released in April. 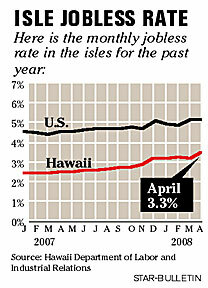 DBEDT estimated that the job losses eventually could push Hawaii's unemployment rate, not including seasonal adjustments, to the vicinity of 3.9 percent. However, according to the state Department of Labor and Industrial Relations, most of Aloha's job losses occurred in the air passenger services sector and were mitigated by the transfer to new owners of Aloha's contract services and cargo divisions. Likewise, Molokai's unemployment rate and jobs were not negatively impacted in April since majority of workers are still retained on the payroll until almost the end of May. "Hawaii's resilient economy has continued to persevere, maintaining high employment levels while helping to maintain relatively low unemployment," said Darwin L.D. Ching, director of labor and industrial relations. Over the past six months, Hawaii's seasonally adjusted jobless rate has been on average 1.8 percentage points lower than the U.S. seasonally adjusted employment rate. Nationally, the seasonally adjusted rate for April was 5 percent, a slight decline from 5.1 percent in March.